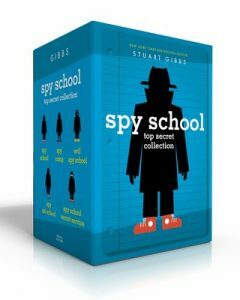 All new Top Secret Spy School Boxed set! OK, this is not the big announcement either. But I have just discovered that my publisher has the first five Spy School books in a really cool boxed set. See? Not only do you get the first five books in the Spy School series (Spy School, Spy Camp, Evil Spy School, Spy Ski School and Spy School Secret Service) but you also get an awesome box to carry them all around in! If you haven’t read all the books, it’s cheaper than buying them all one at a time, and if you want to introduce someone to the series, this is the perfect way. It a great gift for birthdays, holidays, bar mitzvahs, weddings, Halloween or even Arbor Day. Want to get it? Just click here! can you make a boxed set with the exclusive collectors edition? just make the big announcement already! No. Part of the whole point of the exclusive editions is that only a limited run is printed and when they’re gone, they’re gone. And all of the ones that have been printed before are gone. Ummm… what part of the post about the announcement did you not understand? Because I thought I made it very clear that I was waiting for my publisher. If you’d rather I not make other posts about cool stuff like Spy School getting made into a movie… well, I guess you can ignore those. They have the cover of Spy School British Invasion on Amazon! Wait, why was my previous post deleted? What happened? This site reserves the right to remove posts that are detrimental to sales. Oh. I am very sorry about that. I just wanted to make a review and share it with people. Am I allowed to upload positive reviews? Yes, although honestly there are plenty of sites that allow you to post reviews on them that might be better than this site. when will paperback versions of SSGS come out? Paperbacks always come out a year after the hardbacks are released. Thank you so much for your Spy School and Funjungle books! They are my favorite books! Thank you again! WHAT IS THE IMPORTANT POST? The boxed set does not mean the series is over — as evidenced by the fact that neither book six or seven is in the boxed set. I was wondering why when you go to the books section on your blog, you don’t have anything from the MBA series. I’m not sure what you’re talking about. There is no books section of my blog. And if you’re referring to the books page of my website, I definitely showcase the MBA books. As for Murray… Are you asking if I knew anyone who was funny but kind of evil? Not really. I made all those characters up. When are you going to release the new series? I don’t know. That’s what I’m waiting to hear about from my publisher. Can you get this in England? I don’t think it is available in England, although you can certainly have it shipped there. You know today I checked amazon for the price of your Stuart Gibbs Starter Collection, and the price of the New was raised up to $224.73!!!! I just checked myself. You’re right. That’s crazy. I will have to see what’s going on. I just wanted to tell you that your Spy School books have turned my son onto reading. He’s in 5th grade, but struggled since second grade because he never picked up the rules of decoding words. We did a year of reading therapy, which helped somewhat. But the worst part was that he would never practice- he was the poster child for a “reluctant reader.” They best we could do were Diary of a Wimpy Kid books. Last year, I bought your Spy School book, and he refused to read it, too. We had a huge fight over it, and I finally gave him an ultimatum that he would never earn another cent in spending money from me unless he read it. He wailed, “Why *this* book? I’ll read anything but this book!” But I had made up my mind, and I stuck to it. And finally he gave in and started reading it… and then I never had to say another word. I’m going to cry writing this, because he just finished the entire series. We’re looking forward to the next release, but he said he’s going to re-read the series again from the beginning. I just thought you’d like to know that you really made a difference. Wow. Thanks so much for sharing this. It is really wonderful to hear a story like this. I hope that your son will find other writers that he likes as well and continue to enjoy to read throughout his life. My grandson, who lives in a different state, calls me most evenings and we take turns reading aloud your Spy School books. I send him the books and read mine on Kindle. These stories are riveting, fast moving and show kids being capable, problem-solving, evil thwarting individuals. I wish these books had been available when I worked in grade school libraries. It is very difficult to get boys interested in reading books for pleasure. Spy School books change that. Please continue this series. Thanks so much for your kind words — and for reading my books with your grandson! I intend to continue this series for quite some time. Hey, Stu! Let me just say I love all your stories a lot :D. Hope you continue to lengthen each series! If I somehow send it to u, will u read it? I’m sorry, but I really don’t have time to read all the fan fiction out there.